They are efficient predators and can move fast. So, it is easy for them to capture small fishes, shrimp, sea worms, squid and other crustaceans. They are called left handed flatfish. When the fish faces left, the eyes come to upper position of its head. They can change their body colors to match the bottom of water where they usually hunt for bait fishes. They are mostly active during the daylight hours. Adults are very active predators and often chase schools of bait small fishes to the surface. They often stay or move near the sandy or muddy bottom in inshore during the summer. The northern flounders slowly prowl the waters from Maine to the Carolinas. But the Southern flounder feast around inshore inlets and waterway. Southern flounders move from the Carolinas south to the Gulf. Some experts suggest that trolling or drifting for bigger flounder fishing is not the best technique because bigger flounders love to move in places near bridges, docs, piers or other similar hard structures. Summer: Return from offshore winter haunts and then start living and moving in the estuary. Fall: Migrate out the inlets to offshore locations. Spring: Migrate back to search for food. Now we will show you the locations where you will find more flounder. 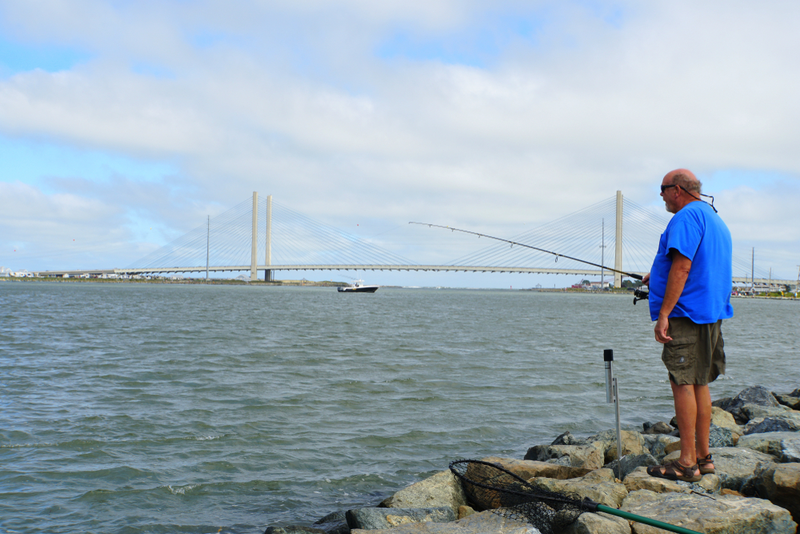 The mouth of estuary creek: Many experts use this spot as their favorite place for fishing flounders. When you see incoming tide, it is a good time. They will be pushed by the incoming tide to the mouth of creek. During the outgoing tide, you will also find some of them at the same location. But do not make sound so that they are not scared. On the bottom of docks, bridges, pilings, jetties, rocks: The prey of flounder is bait fishes. Bait fishes live on or close the bottom of water. 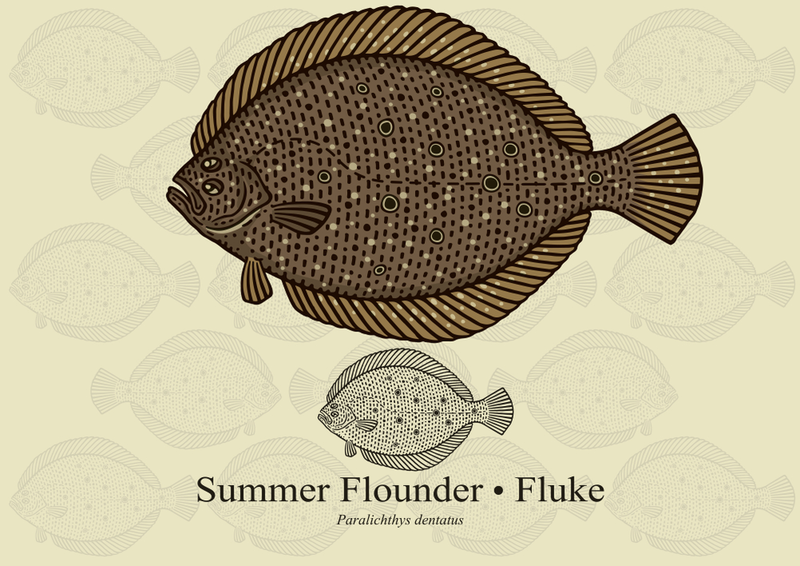 Summer flounders live on or close to the bottom too. It is a bit strange but flounder love to stay or move on the bottom of water near those areas. Salt marsh edges: You may see salt marsh areas near the inshore areas. It is common that these marsh lands are filled with marsh grass. The grassy area is the abode of much marine life. During the tide many bait fishes go through the marsh and some of them come in. Flounder hunts by ambushing its prey. So, flounders go into muddy areas of grassy edge. They use the flattened shape, ability to change coloration and pattern on the eyed side of their body to make hole in the grounds and ready the environment for an ambush. When bait fishes mistakenly comes in, flounders attack them from ambush position and hunt them. Where oysters are found: Flounder surely do not eat oysters. But several bait fishes come and move near the places where oysters live. 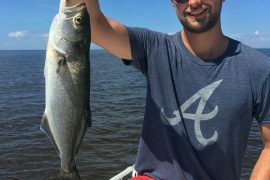 The reason is a bit out of the scope of this article but in short, bait fishes come to the places where oysters are available because it is a part of ecosystem. If you can trace the place where many oysters are available and bait fishes are available too, you may find some flounder there too. So, you see you have many options. If you cannot find one in one location, you can move on and try another location. (b) rigs with live minnows. For best and easiest results, you should use big and live baits. Some suggested live baits are – small pin fish, small menhaden, mud minnows, corncob mullet, finger mullet etc. The other name of small menhaden is flashy pogies. As they like to stay or move near the bottom of water, you should slowly send you bait fishes to the bottom areas where the flounders are available in higher number. But if you are using live baits, do not hurry when you get a pulse in your rod. This is a slow fish and it takes time to totally bite your bait that is in other way the hook. Give it some time to properly bite your hook and then start reeling in. When you cast your bait into the water, let the bait settle on the bottom first. It is a basic technique and it does not matter what bait you are using. Though using live baits is the best option, you can also use artificial lures or modern synthetic baits. Many anglers have used them and got flounders. Set your baits on a jig head and crawl it through flounder territory. When you keep your bait crawling, the lethargic fish will be attracted to your baits and bite faster than baits that are not moving. When using artificial bait, reel in as soon as you get some feel in your rod. The reason is clear and important – a flounder will typically not swallow artificial bait. Even if it mistakenly swallows artificial bait, it will spit as soon as possible. Flounder should be iced immediately after capture. If the storage place is producing melt water, drain the melt water time to time so that the fish is in good condition.